WWW Wednesday is a weekly feature hosted by Taking on a World of Words. I sort of waffled about posting an October TBR this week, but since I already made a TBR post for the R.i.P. 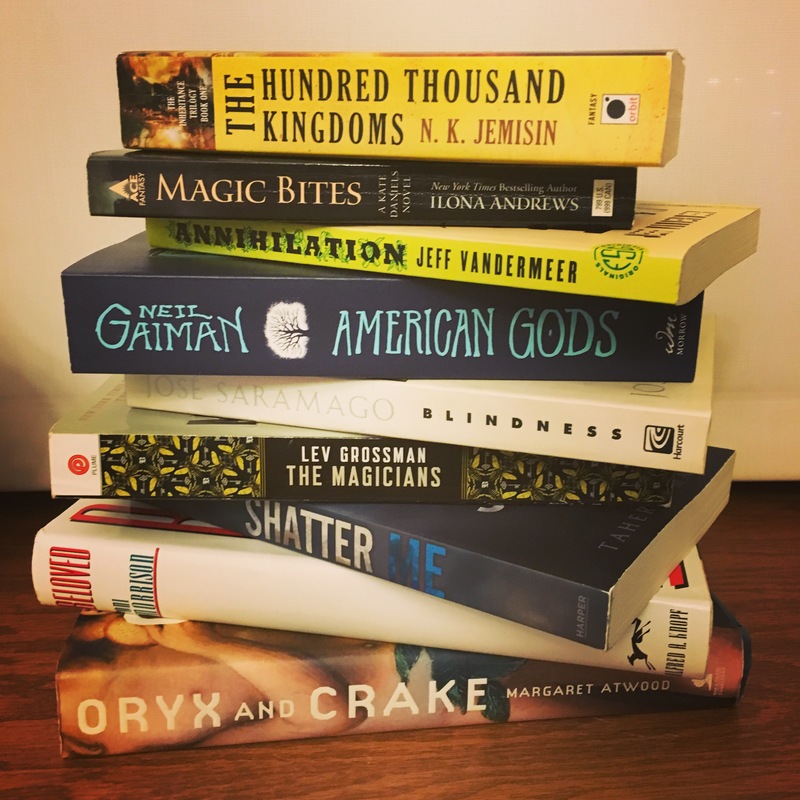 XII reading challenge that covers the majority of that TBR, I decided to hold off and post an update instead. Maybe I’ll still end up posting one. I don’t know! At the moment, I’m only reading one book! This is super weird for me, as 2-3 books at a time is my norm (and sometimes there are more). I’m about halfway done with Night Film by Marisha Pessl, which I put on my October TBR honestly sort of skeptical that I would ever pick it up, but after reading the first page of several TBR books sounded like the most appealing. I’m very much enjoying it so far; it’s fascinating and creepy without being TOO scary (at least so far) and I love that there are newspaper articles and whatnot included along with normal text. This book is over 600 pages long, but it’s flying by so far. This morning, I finished Sourdough by Robin Sloan, which was my Book of the Month Club pick for September. I listened to some of this on audio and read the rest with the actual physical book; it’s a very quick, light read which didn’t blow me away but was a nice contrast to the darker mystery-type reads I had going simultaneously. I’d say that if you are in a mood where you want to read something fluffy and delightful where nothing bad will happen, pick up Sourdough. Night Film will probably keep me occupied for another few days, but I’ll be looking for an audiobook to pick up soon (I needed a little audiobook break after listening to a few in a row) and Final Girls by Riley Sager just popped up in my library holds list. This was my BOTM pick for July and I do also own the physical copy, so I’ll probably jump between the two. It’s a thriller about survivors of horror-movie-type massacres who are later targeted themselves by an unknown killer; it’s very much in the October reading type vibe. I think I’ll also be in the mood to pick up Fever Dream by Samanta Schweblin soon, which is a very short and weird book that was on the Man Booker shortlist and sounds like something I’d be very much into. What are you currently reading? Feel free to link me to your WWW Wednesday post! 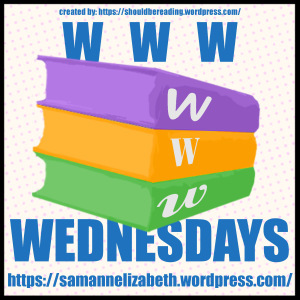 WWW Wednesday is a weekly feature hosted by Sam at Taking on a World of Words. My September reading is starting out strong! Let’s see if I can keep up this momentum. My currently reading pile is a bit of an eclectic mix, which is exactly how I like it. At the moment I’m so absorbed in my audiobook (I also have a physical copy that I might switch to at some point), which is The Last One by Alexandra Oliva. I’d really never considered listening to this one on audio, but while I was picking out potential books for the R.i.P. XII reading challenge, this arose as a book I’d really love to check out. The Last One focuses on Zoo (not her real name), a contestant on a wilderness-survival-themed reality show, and what happens when the structure of the show appears to start breaking down and there may or may not have been some sort of pandemic event while she was isolated in the woods. She has no way of knowing, however, whether this actually happened or if it’s just a part of the show. It’s SO absorbing; the perspective shifts from Zoo later on in the course of the show (she’s called that by producers because she works with animals at a nature preserve) and a third person account of the earlier days of the show and its fan response. It’s also a great read for R.i.P. XII, which I didn’t actually intend to really begin until October, but hey, I’ll take my library audio holds when I can get them. Speaking of starting my fall reading challenge early, I started Vampire Girl by Karpov Kinrade on a whim when I needed something to read for a few minutes on my phone during my lunch break at work. I noticed this book because it was a Goodreads Choice Awards nominee last year (I LOVE following the GRCAs) and it contained the word “vampire,” so I figured I should at least check it out. I’m about halfway done and I will say that the quality of the writing is…not good. I would also say that the word “vampire” is used very loosely here and I would not at all classify it as a vampire book. That being said, it’s so fast-paced that I basically read half the book without even thinking about it, and it’s sort of a fun silly book that I do intend to finish. It just won’t be a good rating from me, unfortunately. And! I’m still only about 40 pages into The Brides of Rollrock Island by Margo Lanagan, but I really love it. Lanagan’s writing is very lyrical, and I love anything that is sort of a dark retelling of some kind of myth/legend/fairy tale. In this case, Lanagan is tackling the myth of selkies, which I think will also provide a lot of commentary on misogyny, which should be interesting. It’s a slower-paced read, but I never feel like I’m lost when I put it down and pick it back up. The first book I finished in September was Blue Nights by Joan Didion. This is my second Didion; I previously read The Year of Magical Thinking in 2015, and Blue Nights is very similar in topic, tone, and structure. Both are memoirs of grief; Magical Thinking focuses on the loss of Didion’s husband, John, and Blue Nights focuses on her daughter, Quintana. They both sort of drift from topic to topic, mimicking Didion’s patterns of thinking and memory; both are very sad and very well-written. I then finished an ARC I picked up from the publisher at BookCon, An Enchantment of Ravens, and thoroughly enjoyed it. 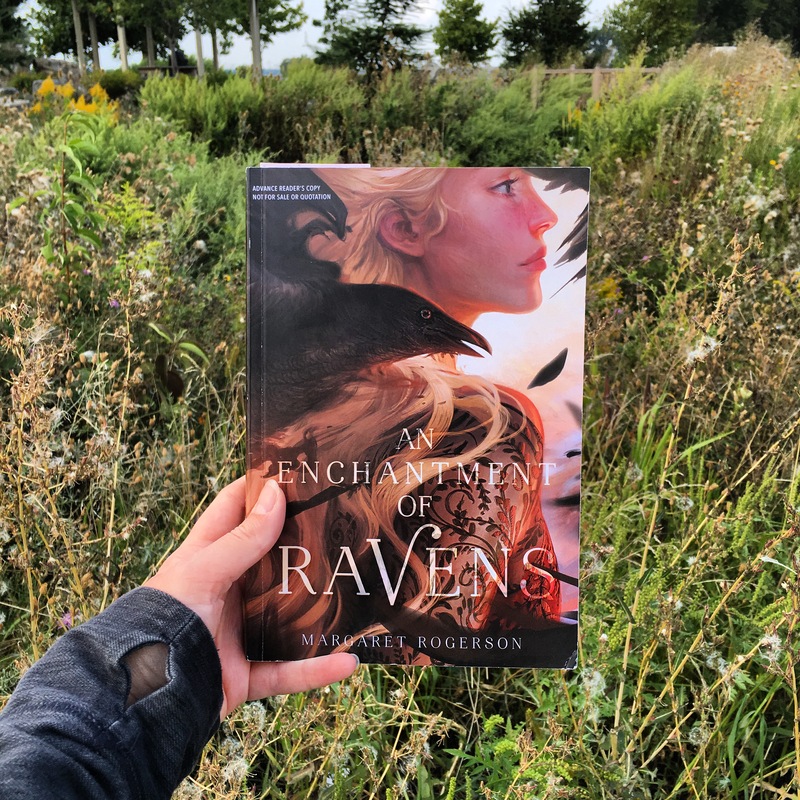 An Enchantment of Ravens is a YA fantasy by Margaret Rogerson, and it takes place in a town called Whimsy which is stranded in perpetual summer due to its connection to the world of the fae, or Fair Ones. The fae in Rogerson’s book are very far removed from emotions and their general humanity, but they covet human artwork and creations more than anything. Our main character, Isobel, finds herself sucked into the fae lands when Rook, the autumn prince of the fae, is furious at his portrayal in a portrait she painted. It’s well-written, self-contained, and in my opinion a perfect YA fairy-related read. It’s set to be released on September 26th. Gather the Daughters by Jennie Melamed! I’ve nearly started this book about four or five times already in the past few days, but it just hasn’t quite felt like the right time and I’ve been waiting until I cut down my currently reading pile a bit. I actually won this book in a giveaway during the 24 in 48 readathon, which was such a wonderful surprise because it’s been at the top of my 2017 releases TBR. Gather the Daughters is focused on a cult and its misogynistic tendencies and has drawn Margaret Atwood comparisons, so it sounds right up my alley. After Gather the Daughters, I have absolutely no idea what I’ll pick up next. I do hope that my library hold on the audio of The Glass Castle by Jeanette Walls becomes available soon, because I think I’ll be in the mood for another memoir by the time I finish my current audio. Have you read any of these? Feel free to link me to your WWW Wednesday post as well! 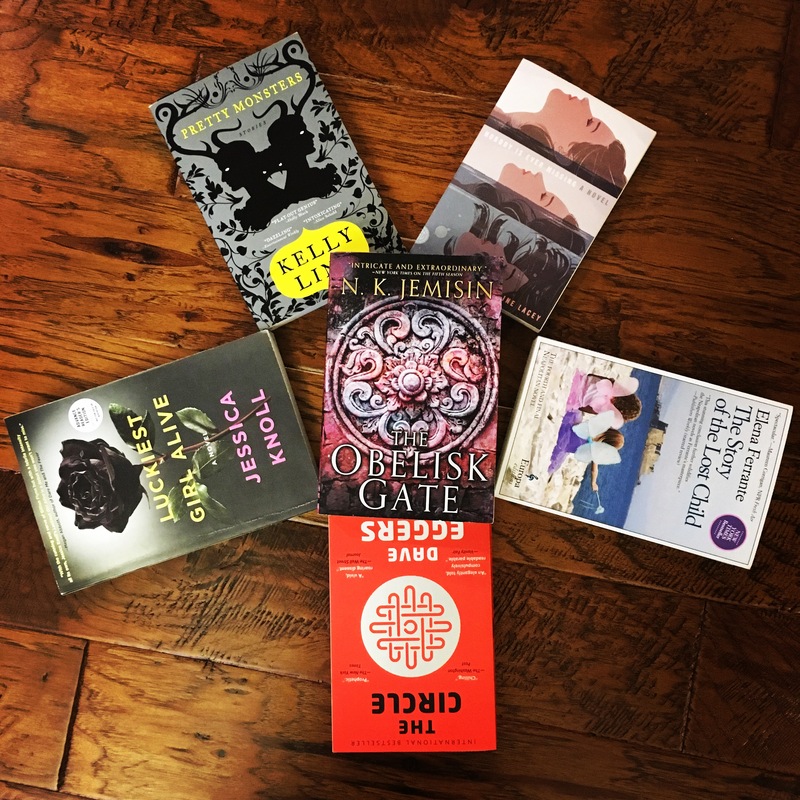 WWW Wednesday is a weekly feature hosted by Taking on a World of Words where you answer the 3 W’s: What are you currently reading? What did you recently finish reading? What do you think you’ll read next? 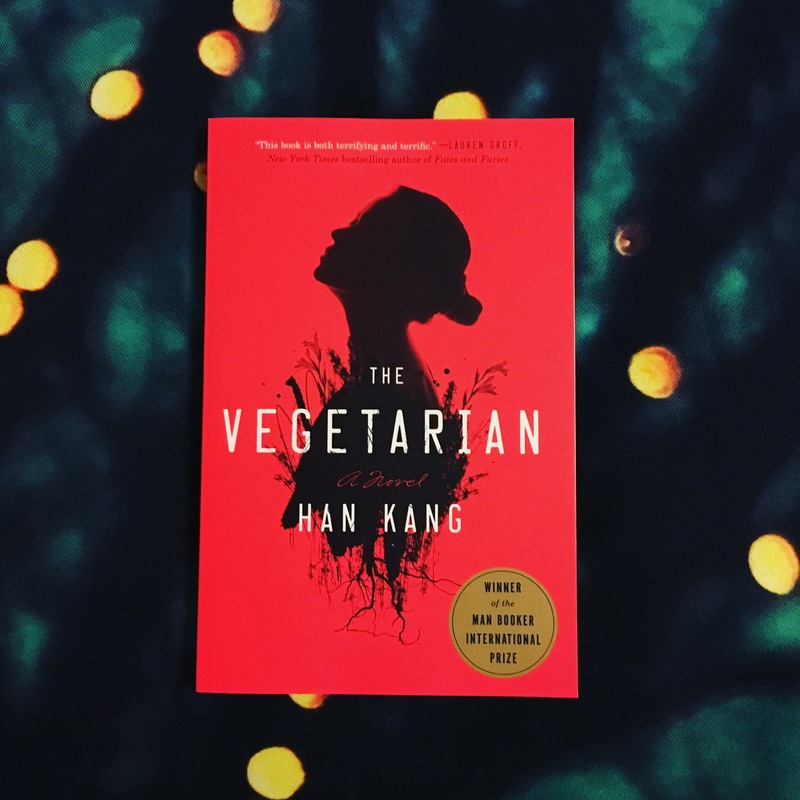 I recently finished two short, dark, and October-y books: The Vegetarian by Han Kang and The Daylight Gate by Jeanette Winterson. Both were very good, and somewhat disturbing; they left me wanting to look for something a little happier to read next. I’m so glad to have finally read The Vegetarian after hearing all of the hype; I thought the writing was excellent and I loved how it was told in shifting perspectives. I also recently finished an October-y audiobook, Bird Box by Josh Malerman. I wasn’t a huge fan of this book–the premise sounded interesting (people starting killing themselves mysteriously, and we discover it’s linked to something they see that their brains are unable to handle; the world descends into a post-apocalyptic scenario with people essentially trapped inside their houses and leaving only when blindfolded) but the writing wasn’t great, and the characters were very flat. It definitely scared me, though, which was what I wanted out of a horror audiobook. 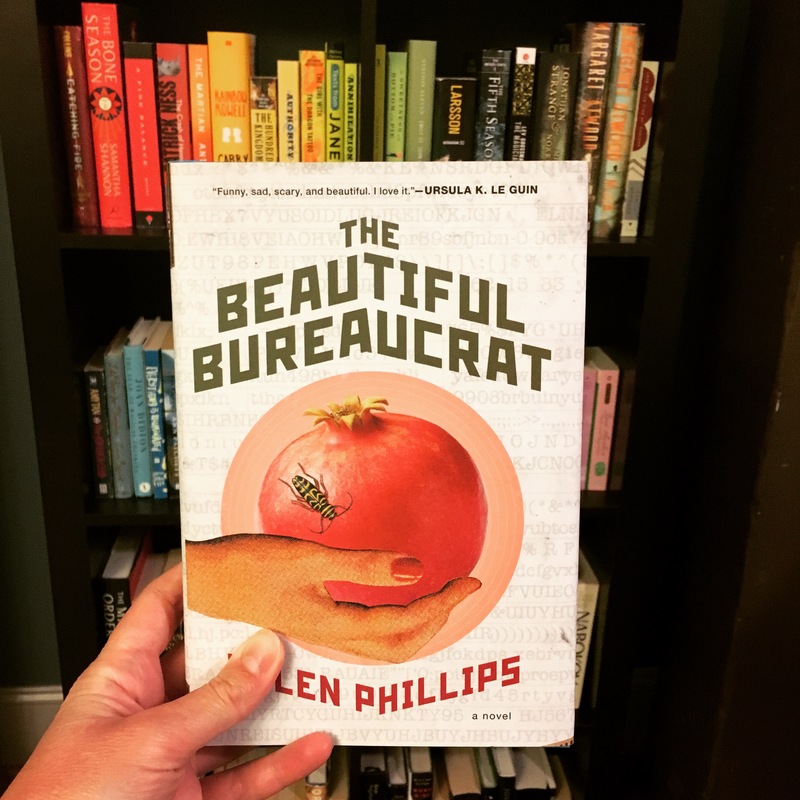 I recently started Helen Phillips’s The Beautiful Bureaucrat to continue the streak of weird, short books in October. This book focuses on a young woman who gets a desk job where all she does is input numbers attached to names into a database, having no idea what the purpose is. Supposedly things start to get super strange from there, although I haven’t gotten that far yet. I do really like the writing. I’m also almost done with my current audiobook, Furiously Happy by Jenny Lawson, which I’m liking and finding very easy to listen to. It’s a memoir/collection of essays about her life and struggles with mental illness. I’m not sure! 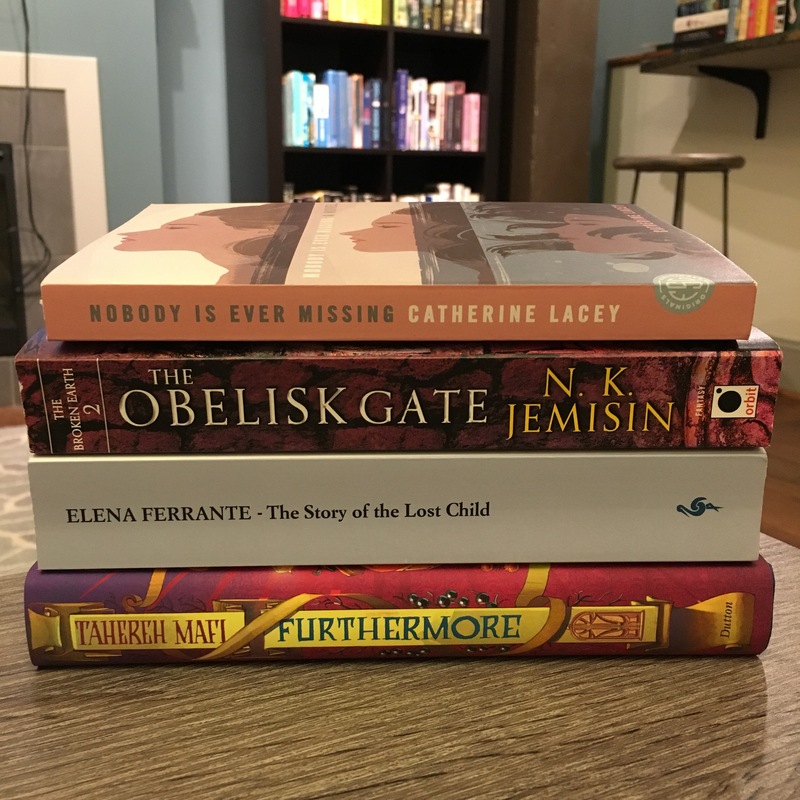 I’m getting super excited for Dewey’s Readathon on Oct 22, and have already started to put together my TBR stack for that, which I’ll talk about in an upcoming post. For audio, I’m really hoping to start Kameron Hurley’s The Geek Feminist Revolution soon, but I’m waiting it to come in from the library. As far as physical books go, I’d like to read at least one more before Dewey’s starts, but I’m not sure what to go with. What is everyone reading right now? Feel free to link me to your WWW Wednesday posts! It’s been awhile since I’ve finished a book. My reading in August was pretty mediocre, unfortunately, but I’m really hoping that will change this month. The answer is everything, basically. See picture below. The Story of the Lost Child by Elena Ferrante – I feel like I’ve been reading this book for years, but it’s only been 2 months or so. Since this is the last book of Ferrante’s Neapolitan Novels, I expected to be blown away and for this to be a solid 5-star read; the fact that it hasn’t seemed that way is what’s causing me to read so slowly and start other books in the meantime. Luckiest Girl Alive by Jessica Knoll – I’ve been listening to this audiobook for awhile and liking it, but this weekend I went on a road trip for a friend’s bachelorette weekend and listened to this on the way down. Without giving away any spoilers, I reached a point in the book where this big twist comes out and I got completely hooked on the story; I’m still reeling whenever I think of certain scenes. The only problem was that I got to my destination about 3/4 done with the book, and my library checkout expired before my return trip home! I was super disappointed because all of the copies were checked out and I had to put another hold on it. The Circle by Dave Eggers – faced with the prospect of a 5-hour drive back home after my weekend away and no audiobook, I sort of randomly decided to give The Circle a try. I wanted something really absorbing and I definitely got that, and then some. I really, really like this book; it’s sort of very near-future scifi, focusing on a twentysomething who starts work at the world’s most famous tech company and gets sucked into company life, which seems like it aims to absorb you fully through social media. A big part of why I like this book so much is due to the narrator, Dion Graham, who is absolutely fantastic. He has a great voice and does a wonderful job with each new character, and his enthusiasm keeps you listening. He’s the first audiobook narrator that I looked up thinking that I’d listen to other books just because of his narration; I found out that he also narrates (among others) A Heartbreaking Work of Staggering Genius (one of Dave Eggers’s other books) as well as Octavia Butler’s Wild Seed (and he’s won several awards for his narration). Nobody is Ever Missing by Catherine Lacey – I haven’t picked this book up in awhile, but I think it’s really well-written and I just need to jump back on board. It’s about a woman who runs away from her life in the U.S. and hitchhikes across New Zealand, all in sort of this dreamlike haze of narration. Pretty Monsters by Kelly Link – I’ve read a few of the short stories in this collection, and I may end up putting the rest on pause until October–not because it’s not great, but because Kelly Link’s mix of fantasy/scifi/horror would work well for that month. I do like to do some Halloween-themed reading in October, and my plate for September is pretty darn full right now. 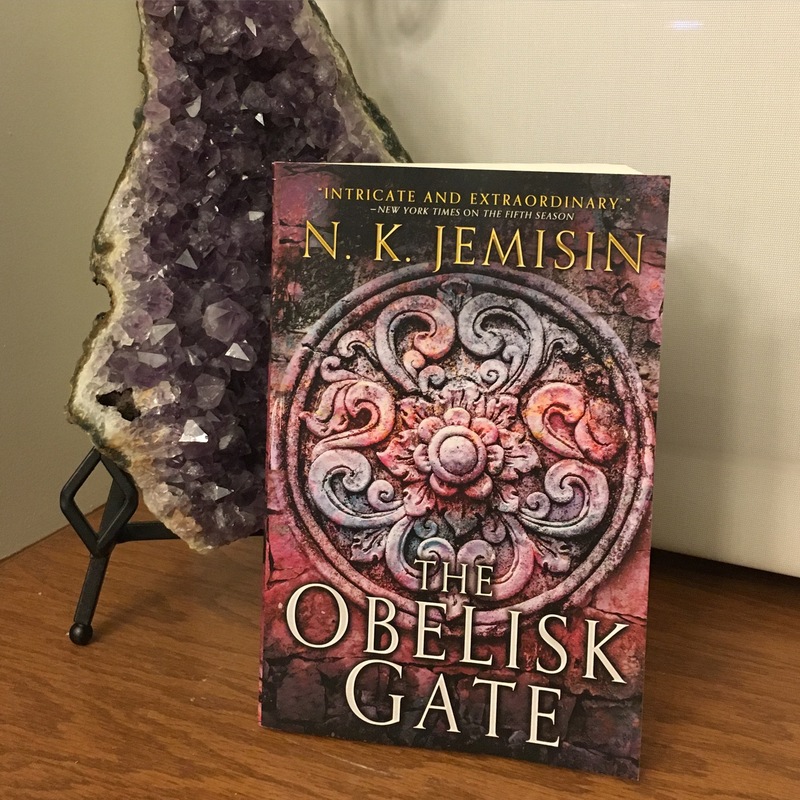 The Obelisk Gate by N.K. Jemisin – I couldn’t resist the temptation to start this book even though I have so many others going! I’ve been waiting for this book for a year now, and after reading the first few chapters I realized that I really need to go back and re-read some of The Fifth Season (the first book in this series) so that I’m not forgetting any of the events that the characters are referring to. It’s been a full year since I’ve read it, so some refreshing is definitely necessary. As I mentioned before, my main goal in September is to finish the plethora of books I’m currently reading. Once that happens (or once I finish a few of them, at least) I’m planning on starting Furthermore by Tahereh Mafi. I love Tahereh Mafi; her Shatter Me series got me through the intense stress of studying for/taking/recovering from my grad school exams, and I’m really interested in this book despite the fact that it’s middle grade, which I never read. What are you guys reading right now? Feel free to link me to your WWW Wednesday! Random stack of some of my favorite books. WWW Wednesday is a weekly feature hosted by Taking On a World of Words (https://samannelizabeth.wordpress.com/). You answer the 3 W’s: What are you currently reading? What did you recently finish reading? What do you think you’ll read next? Things have been crazy and I was out of town for a bit, so I haven’t been posting much lately, but I’m back! I’ve been really enjoying reading outside with the gorgeous summer weather, and I’m definitely looking forward to the #24in48 readathon, which starts in a little over 2 weeks. Is anyone else participating? My current audiobook is still Men We Reaped by Jesmyn Ward; I actually own this audiobook (I almost never buy audiobooks) so I had it on pause for a bit while I finished some library checkouts. It’s devastating and powerful, and so beautifully written. I’ve also had Blue Lily, Lily Blue on pause; I just really haven’t been in a Raven Cycle kind of mood lately. I really do want to finish the series, but I need a break from it right now. 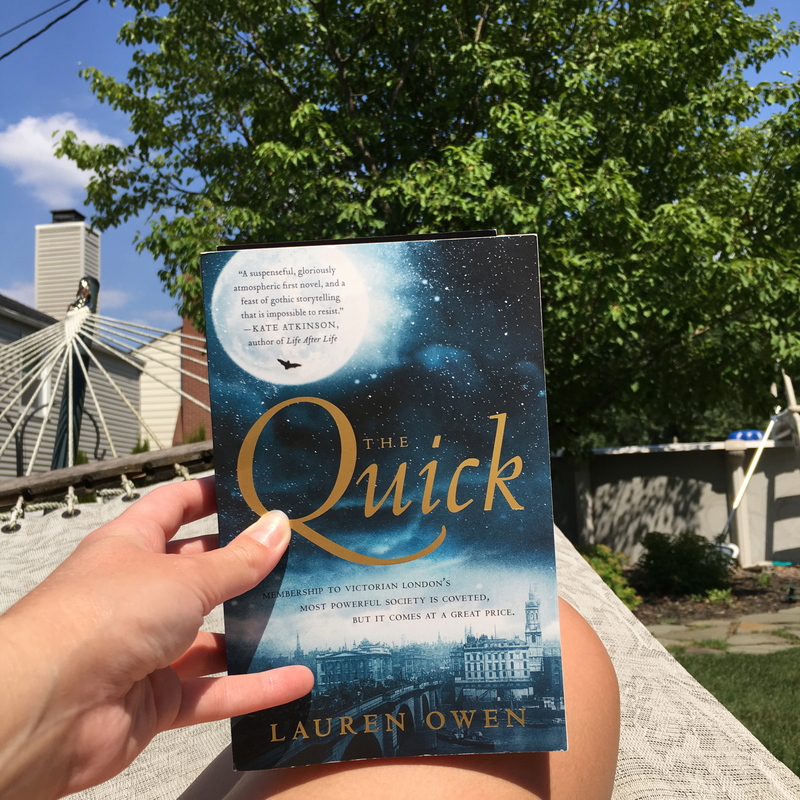 And I just started The Quick by Lauren Owen; all I really know about it is that the premise involves vampires in Victorian London, which is right up my alley. I’ve heard really mixed things about this book, and it has a low rating on Goodreads, but I really like the writing style and atmosphere so far. One of my absolute favorite books (The Magicians by Lev Grossman) has equally bad reviews and a low Goodreads rating, so I try not to put too much stock in that. So many things!!! So I finally finished Those Who Leave and Those Who Stay, the third book of Elena Ferrante’s Neapolitan novels; the quality of the writing remains fantastic and I am so anxious to see where Lila’s and Lenu’s stories go next. I finished 2 (!) audiobooks recently, which is a LOT for me (I’ve posted before about my audiobook struggles) and I really enjoyed both of them. The Immortal Life of Henrietta Lacks was really informative, and I feel like it’s important for everyone to know Henrietta’s story; I do agree with other reviews I’ve seen that I could have done with less of the author inserting herself into the story. I thought that Shrill by Lindy West was funny but extremely raw and true; I knew nothing about this audiobook and picked it up solely due to bookstagrammers’/book bloggers’ recommendations, so thanks, guys! I also finished Gods Behaving Badly a few days ago; it wasn’t amazing but was a fun and funny satire of Greek mythology. I’ve been hearing amazing things about The Argonauts on book blogs and Bookstagram, so I went ahead and bought the audiobook to listen to next. I definitely will be picking up the final Ferrante book, The Story of the Lost Child, soon, but first I need to prepare myself for the emotional onslaught I know it will be. The amazing-sounding Lagoon is absolutely coming up next when I finish one of the physical books I’m currently reading. I’ve also been thinking a lot about what I’ll read for the 24 in 48 Readathon (July 23-24!) but that’s still 2 weeks away so I don’t want to post my readathon TBR picks yet. What has everybody been reading lately??? WWW Wednesday is a weekly meme hosted by Taking on a World of Words (https://samannelizabeth.wordpress.com/). Right now, I’m in the middle of two quartets of books and really engrossed in my current audiobok (Men We Reaped). In other bookish news, I heard that Margaret Atwood’s Alias Grace is being made into a miniseries! The more Atwood, the better, in my opinion; I haven’t heard any news lately on the Maddaddam TV series, so I hope that’s still in the works. So far, Men We Reaped is really incredible. Jesmyn Ward’s writing is somehow both clear and layered at the same time, and she’s so good at creating a sense of place. The story she tells is traumatic, and I’m amazed that she found the strength to tell it. I’m over halfway done with The Dream Thieves (the second book in the Raven Cycle) and it’s really good. I’m so glad that I started this series; it’s been awhile since I found a good YA series that I can really get sucked into. The characters in this series are what keeps me hooked (although the plot is definitely weirdly good as well) and I think Ronan might be my favorite. Although Blue is a great protagonist, and it’s pretty impossible not to love Gansey. I’ve stalled a bit on Those Who Leave and Those Who Stay; it’s not that it isn’t great, but I’m having a little reading ADD and YA seems to be really working for my reading mood at the moment. I’d like to dive back in and finish it by the end of the month, but we’ll see. The Raven Boys (4 stars) and The Cuckoo’s Calling (3 stars). I’ve been wanting to get to The Girl Wakes by Carmen Lau for awhile–it’s a book of short stories focused on dark feminist fairytale retellings, and it’s pretty short, so I’ve been waiting until I get a stretch of time to read it in one sitting. I’ll probably start the third book in the Raven Cycle (Blue Lily, Lily Blue) after I finish The Dream Thieves, and I already checked it out from the library in preparation. Also, with all of this series reading, I’d really like to pick up a good standalone next; I’m thinking maybe Lagoon and/or The Book Thief. What is everyone reading right now?? ?